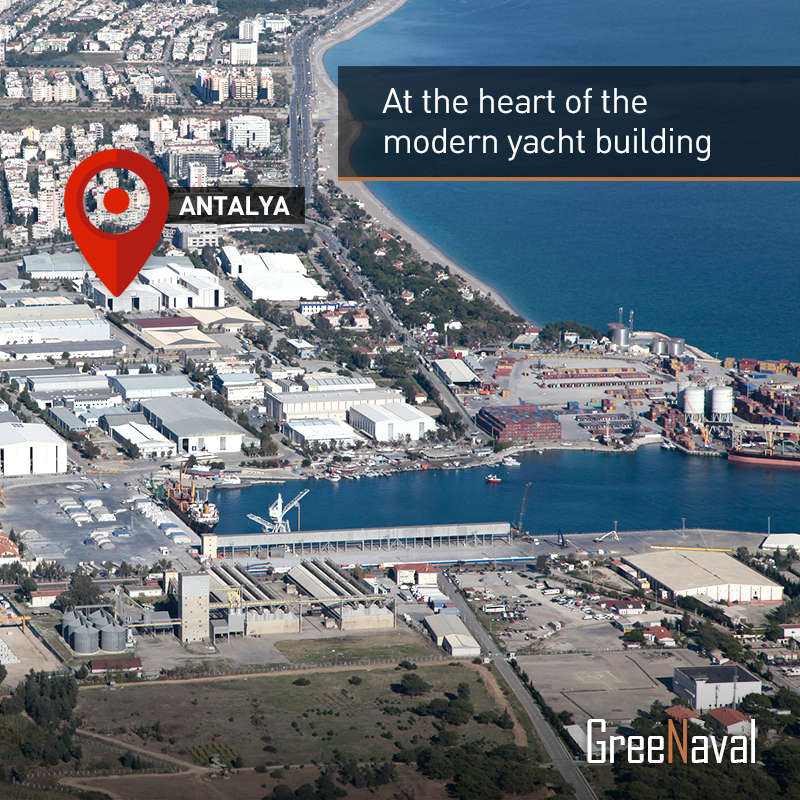 Many of you have asked for more information on the “Free Zone” and surrounding area here in Antalya where Möbius is being built at Naval Yachts shipyard and hence this post. I’ll do my best to provide more postings over time to show you around the Free Zone, Antalya and this part of Turkey and the world in future blogs. * Note that you can click to enlarge any of these photos. The aerial shots above and below will give you a good birds eye view looking approximately SW over the majority of the Free Zone area with the Free Zone harbour in the distance. The Free Zone and our apartment which is just off to the right of this photo are at the very western end of the large city of Antalya which makes for a great location for us as we are nestled up against those beautiful mountains you see in the background here and we can be on the D400 coast highway that runs all the way up that coastline you see stretching off into the distance at the top of this photo. 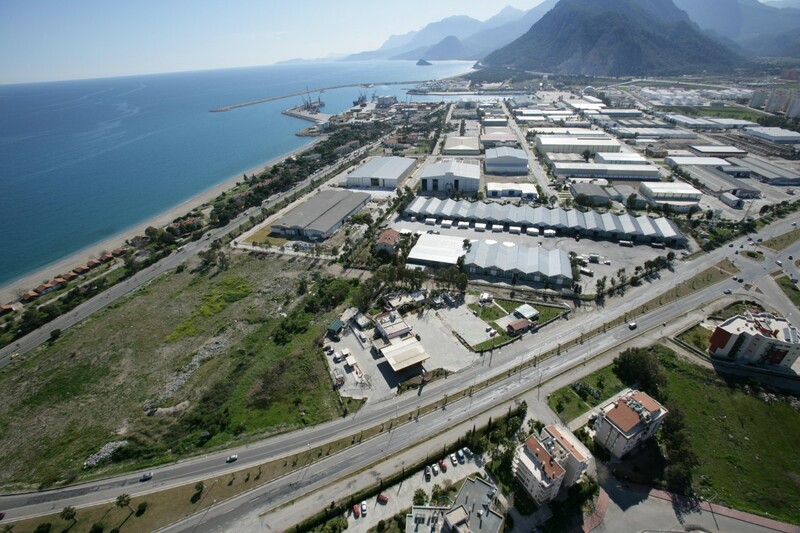 There are 2.2 million people in Antalya Province so the rest of the city stretches out for about 15km along the crescent curve of the coast to the East. This photo is looking approximately East across the buildings of the Free Zone and you can see the first stretch of the city and the coastal “main street” going off the top. You get the idea and so it is no surprise that many of the world’s top design firms for large yachts and ships chose to build their boats here. We have chosen Naval Yachts to be our builders and as you see more of their shipyard below and the results of their work in upcoming posts, you will easily see why. To give you a bit better feel for the area I thought I’d start with this short video I shot yesterday as I was leaving the yard and heading home from “the office” at Naval Yachts. Yesterday morning Christine was looking out one of the many corner windows we have in our nearby 10th story apartment (see map below) had saw this little guy docking . Then as you can see it was rather hard for me to miss as I drove out of the Free Zone on my way home last night. What you’ll see in the video is the harbour contained within the Free Zone where boats are launched, hauled out and worked on. I’ll do my best to provide more photos and videos over time and hope this quick 360 video of one aspect of the Free Zone would give you a better sense of the scope and scale of this place. I will maybe mount the GoPro camera in the car and shoot some video driving around the various company shipyards here in the Free Zone but even in this short 360 video you can see several of the buildings of builders such as Damen and Ares. And I’ll come back for more videos of this harbour/launching area over the coming months when other interesting ships are being launched or here to be worked on. And of course Christine and I already have dreams of the day when we’ll be here to watch Möbius slip into these waters for the first time but that’s a ways off yet and we have LOTS to keep us busy and excited with the building process in the meantime. As you might notice in the video the we have a rather lovely mountainous backdrop to this location as well. If you look closely you’ll see there is a cable car ride up to the café at the summit which is just on the other side of that cruise ship. 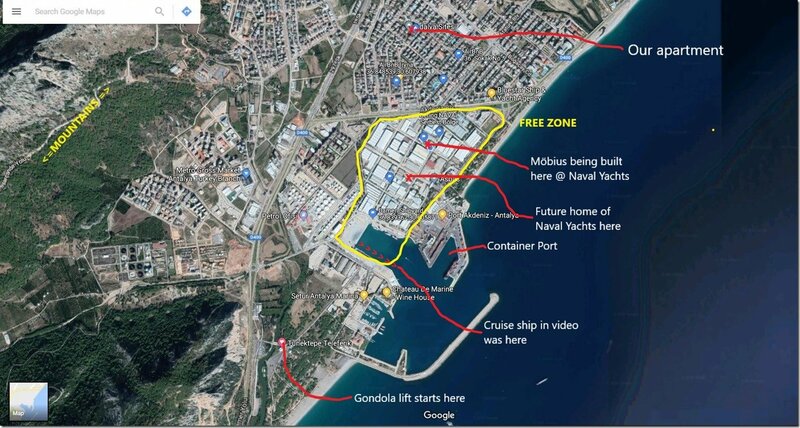 Here is a small clip of a sat map that will show you the breakwater and harbour and the overall Free Zone area. 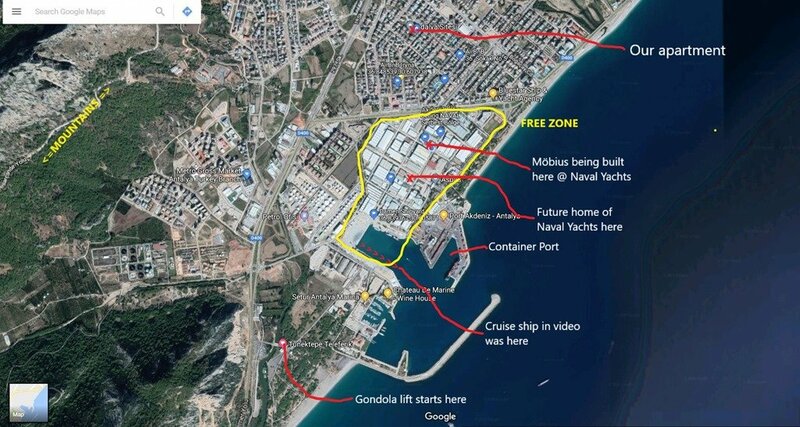 Our apartment is literally within walking/biking distance, the container port where our container is hopefully going to arrive soon as well as all the loads of supplies we need for Möbius is right beside the Free Zone and you can see where you catch the little gondola to go up to the top of that peak I mentioned in the video. Continuing with the title’s theme of Scope & Scale let’s fly up a bit higher so you can see more of the whole indented coastline we are in the midst of. Even this small shot shows the diverse geography and climates we are surrounded by. Walk on the beach in the morning, gondola ride up to 2800m throwing snowballs at the top of Mount Olympus in the afternoon for Christine’s birthday a few weeks ago and back to the 5th largest city in Turkey for dinner. And up a bit higher still to help put our location into context of this end of the Mediterranean. Take your pick; Europe to the left, Asia and Middle East to the right and Africa below. Not a bad place to build a boat when you’re sandwiched between mountains on one side and a Mediterranean beach on the other and those were amongst the many factors which convinced us that Antalya Free Zone was the best place to spend the next few years building Möbius.